Ready To Restore: This vintage, 1900 Steinway Model B was manufactured during Steinway & Sons’ golden age. Featuring a regal and distinctive African Flame Mahogany veneer on a Victorian Style Art Case design, this concert level instrument is in excellent structural condition and is a perfect candidate for a full restoration. This piano is in ‘ready to restore’ condition and can be refinished in your choice of either mahogany or ebony. Steinway Model B #98818 was built in 1900. A lot was changing around the turn of the century, but Steinway quality and innovation remained consistent. Often dubbed ‘the perfect piano’ these instruments are a consistent favorite of professional concert pianists, concert venues, and universities. Steinway’s replacement for the Monitor Grand, these concert instruments were first introduced in 1878. Measuring 6’11” in length with a large soundboard area, these pianos were designed to produce a full, rich bass with a broad, beautiful overall quality of tone. When properly rebuilt, these pianos sing beautifully from the top of the treble to the rumbling bass section. Crafted in an art case design, this Victorian-styled piano features hand carved details and ‘ice cream cone’ type legs. This piano is currently in a semi-gloss finish over an African Flame Mahogany veneer with a grain pattern that is beautifully figured across the entire piano cabinet. This art case grand piano will look stunning when fully restored and refinished. Here at Chupp’s Piano Service, we have over forty years of experience in rebuilding, repairing and retailing Steinway & Sons pianos. Our carefully restored pianos grace the stages of concert venues the world over. We are confident that this piano will be a great fit for you and we are experienced in fine-tuning these pianos to fit your specific playing preferences. Turn of the century Steinway & Sons grand pianos are a testament to the high quality that was standard at the New York and Hamburg factories during the era. This dedication to innovation and high standards is what has made the Steinway name legendary. An incredibly high level of woodworking skill and overall craftsmanship is evident in every Art Case Steinway. Luxurious woods and detailed hand carvings speak of elegance and an uncommonly superior standard of work. That tradition of excellence is carried on here at Chupp’s Piano Service. 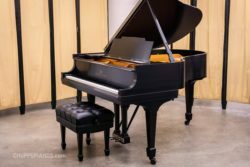 We are a full-service piano business and have a wide selection of Steinway Model B grands and many other models in our showroom and rebuilding facility. We have a number of ready to restore and fully rebuilt Steinway Model B Grands for you to select from. Of course, it is best to judge these pianos for yourself! We are confident that any one of our premium restored or ready to restore Steinway & Sons pianos will satisfy even the most discriminating of artists. Vintage Steinways are highly prized by many – for good reason. We are ready to assist you in locating the piano that you have been dreaming of! Don’t live near us? We regularly work with clients from across the continent, ensuring their instrument is tailored just for them. Contact us if you have any questions or would like to set up an appointment to see our facilities and the world class pianos we have in stock. Error: Error validating access token: Session has expired on Thursday, 10-Jan-19 19:00:02 PST. The current time is Wednesday, 24-Apr-19 23:55:24 PDT.